So this weekend, Google rolled out what is considered to be Penguin 2.1 & while this may be daunting for many, there are some positive out of all of this. Why is there updates to a search engine that seems to be working fine? While the search engines seem to be working fine, there are many manipulators out there that are using black hat tactics to benefit them and their sites. 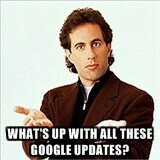 This is a common reason why people think Google hates SEO. 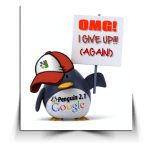 The reason behind the various updates, including Penguin 2.1, is to enhance the user experience. To eliminate crappy websites from appearing on top. To avoid obvious manipulation to the searches. Now, many people would hate me for saying this but I don’t mind the G updates. I really don’t. I enjoy them because they usually work in my benefit. With my various methods and techniques, I stay on the top positions while my competitors disappear to a place unknown. These updates to the algorithm are designed to weed out the bad, spammy websites while giving benefit to the sites that seem to be more natural. Sites that don’t throw thousands of links to it. Sites that serve a purpose. So how do I benefit from the updates? Easy! Most SEOer’s work mainly on link building. They think that the more links you have, the better your site will rank. Thankfully, they are mistakenly wrong. There are a lot more factors that become involved to these special methods. Good thing that Penguin update came because most of my competitors dropped their rankings.